The Camping Alpine Tents are”A” shaped light weight Camping Tents. Generally used as high altitude tents, for camping and over night stays as these are Weatherproof Tents. It is a double fly tent .Both the flys are made up of nylon waterproof taffata fabric in different colors. This Camping Tent comes complete with aluminum folding pipes and steel pins. Packed in carry bag for easy transport. The main Features include, a tough nylon taffeta cloth which is used to construct the inner tent and fly sheet which stands on two vertical and one horizontal aluminum folding poles. Fly sheet is extended on the back side in 2 Men Tent and 4 Men Tents and touch the ground giving extra space to store your camping equipment and back packs. Tough, coated nylon ground is water proof and stitched with inner tent. Main gate is provided with see through mosquito net and half opening zipped gate at the back to utilize the back gate for storage under fly extension. Our Camping Tents are provided with sufficient pockets and loops to hang anything inside the tent. This Tent comes complete with stuff sack, pegs, poles, cord and stoppers. We stock exclusive light weight camping tents like the 2 Men Tent, 4 Men Tent, 6 Men Tent, 8 – Men Tent. These tents are easily portable and very easy to set up at the camp and dismantle, while leaving. We also make sleeping bags for your trekking and camping purpose. These tents are very user-friendly and reasonably priced. 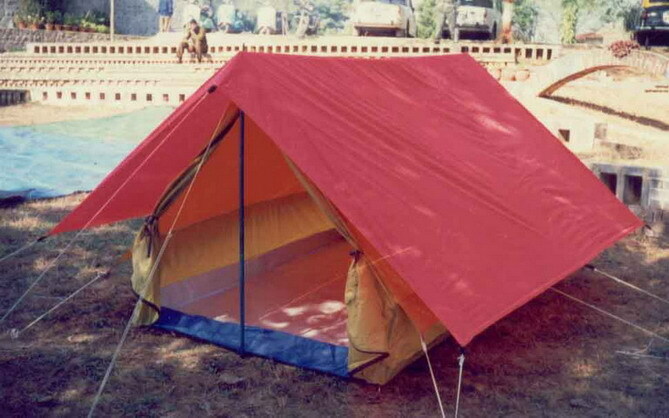 We are the leading Manufacturers and Exporters of easily Portable Camping Tents in India. These tents are mainly used for mountaineering and trekking on hills and mountains by campers. Camping and Glamping is very much in fashion these days, and best is to carry your own Camping Tent and Sleeping Bag, along with you. The thrill lies in carrying your own stuff while trekking and putting up a camp where you wish to spend the night and light a camp fire. 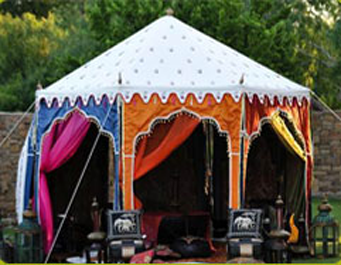 Our tents help you to lead this adventurous life while you are on your nomadic holiday. A number of tents can be erected side by side to make the entire Camp with a Camp fire in the middle. We also make Larger Camping Tents, where you can put up a base camp with all Swiss Cottage Tents in the Jungle and guests can stay for weeks, close to the nature and enjoy the comfort of a cozy cottage too. These tents have the facility of a front porch, a cozy and spacious bedroom and a changing room or a washroom at the back of this tent. The beauty of camping lies in living close to the nature and opening your eyes to a bright and beautiful morning sun rise, from your tent window.